Remember the last episode I found black gunk in the cylinders? Remove all the paraphernalia around the head. Like manifolds, rocker cover, temp sender and so on. Start loosening the head studs. Well three of the nuts, on the external studs, were frozen on their stud, which came out instead. Never mind, a spanner and the vice will remove them. The internal ones were easy, being oiled. Also removed the rocker shaft. Now, to lift the head. OK where’s the nut or bolt I missed? Triple checked everything but nothing left to hold the head down. Maybe it’s the gasket being stuck. Try levering the head up. Managed to get a small crack between the head and block. Even with cold chisels inserted as wedges and a 3 foot bar the head stubbornly refused to come off. I was about ready to get the oxy torch and cut the damn thing up. After many hours of trying many methods of lifting the head I gave up and went and watched tele. The next day I scratched my head, (easy to do, not much hair), and decided to remove the studs and see what that did. Using two nuts tightened against each other I easily removed the external studs (those still remaining). However, the internal studs were extremely hard to turn. Bugger, must be rust binding them. Anyway persevere and eventually got them unscrewed so that the head would come off, though the studs were still firmly imbedded in the head. When I got the head to the bench I quickly found the problem. Sometime in the past someone had replaced the manifold studs with threaded rod. Not an unreasonable fix for mangled studs. However,,,,, on the B heads the stud hole is drilled and tapped all the way though, into the hole for the head stud. The damned threaded rods were acting as grub screws on the studs! See picture. Sooo, remove these threaded rods and loctite them into position so that they don’t protrude into the head stud hole and this problem is solved. Now back to the reason for removing the head, the black gunk. 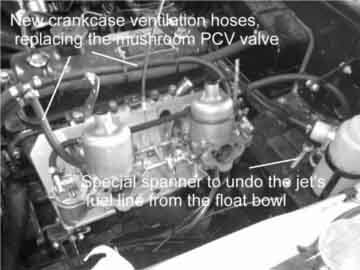 As it turned out only the front two cylinders were affected, caused by half the innards of the PCV valve missing. Full vacuum sucking oil from the crankcase, hence the black sludge. Replaced the PCV valve with two rubber hoses to the constant depression ports on the carbys, between the piston and the butterfly disk. All the cylinders and combustion chambers were easy to clean with just a rag. During this I found that the pistons were new, with 060 stamped on the crown, which, I presume, means 60 thou oversize. There also seems to be an insert around the exhaust valves, which I presume means that it has been modified for unleaded fuel. So the engine has been done up. Anyway put it all back together, reset the tappets, again. and fire up. Starts no worries, but still has the shakes at 1500 rpm. Rear plugs black. Clean them and go through the whole carby setup once more. Get to the point where the front plugs have a reasonable colour, but the back ones are still black. Adjust the mixture nut , equally on both, until the engine has a slight increase in speed then dies. Classic correct mixture symptom. Back plugs still black, engine still shakes. Decided to check the valve timing, maybe that is out causing the shaking and black plugs. Drain the cooling system again, remove radiator and then the timing cover. Dimples on crank and camshaft sprockets line up correctly. Maybe a “hot” cam. Check the valve opening and closing angles. According to my eye gauge they were pretty spot on. So not the cam or valve timing. Replace everything, reset the timing and start. Same story with the shakes. OK, what next? Let’s check the ignition timing, again. Out with the timing light, start engine, crawl under the front of the car, and point the strobe at the crankshaft pulley. At about 800rpm the ignition timing was jumping about from zero degrees to fifteen degrees advance.. Should be 10 degrees. Another head scratch. Where can the “slop” be? Distributor drive from the cam? No that’s OK. 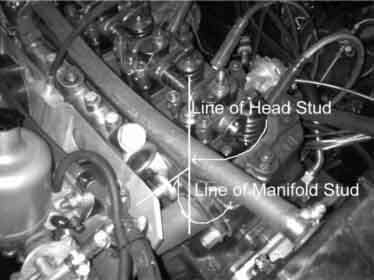 Timing chain or tensioner? Another bugger, as this requires the removal of the timing cover, radiator etc, as for checking the valve timing. Why didn’t I think to check this when I had the cover off previously? Old age, I guess. Now start the engine and lo and behold… the shakes are still there. So it has nothing to do with the distributor drive. Maybe because it is running rough the instantaneous revs are up and down causing the centrifugal advance to jump all over the place. Don Campbell was kind enough to come and have a look. The only thing he found was that the distributor rotor seemed to be between plug contacts and hence randomly firing the wrong plug. For the silly season at least. Now that Chrissy and all that is behind me, have another head scratch. Decided that I would stick the old distributor back in to see what it does. Swear, swear curse. With the old distributor the engine runs quite well, though a bit rough, probably due to mistuning. But no shakes. Why would a new 123 GB4 distributor cause the shakes?? The distributor setup wrong? I’m sure that I followed the instructions perfectly. Oh well, go and check the distributor curves against the B curves. After staring at both curves for ages I decided that the 123 needed to be installed 10 deg further advanced, as is the original one. This conclusion comes from staring at curves, reading the installation instructions and looking at the curves again. Basically the instructions say to set the alignment mark to Top Dead Centre. I had set the notch in the pulley to TDC. However, now I thought “what if they mean the TDC mark is the notch and the alignment mark is the 10 deg advance mark”? ( After all it is a foreign made product and maybe their English leaves a bit to be desired.) This would shift the curve to be nearer the B’s curve at 2000 rpm. Run out and whip the 123 back in, set-up to the 10 deg mark and fire up. Seems to run much better, no shakes. Halleluiah, finally got it. Now I posted the info about the instructions on a couple of forums ( fora? ) and was promptly shot down. Yes the 123 must be setup with the notch to the TDC mark. The other way would give 40 deg centrifugal advance max and could blow a piston. The next thing to try is a more advanced curve, B looks good. Love these cliff hangers, don’t you?